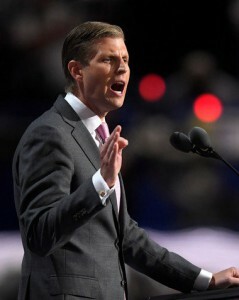 Cleveland, July 21 – Eric Trump had one message to the Republican National Convention last night – his father is “running for you” – and, for the first time since the convention began Monday afternoon, his speech included America’s largest minority group – people with disabilities. Until Eric Trump’s speech, no other primetime convention speaker had mentioned disability directly in his or her speech. Yet one-in-five people in America have a disability, and more than half of American voters have a close family member or friend with a disability. However, using terms like “special needs” offends many in the disability community. People with disabilities are a protected group under the Americans with Disabilities Act, while a person declared to have special needs, but not a disability, does not have the same protection. This applies to health care, education, employment and more. On several occasions, Donald Trump has said he employs people with disabilities or has “spent a lot of money making buildings accessible.” As a business owner and builder, he is legally required to do so. He has said he is committed to helping more veterans and people with disabilities become employed, replying “I will” when asked this question. Yet six months later, Jane is still waiting for any concrete plan or ideas. The positions page on Trump’s website is lacking a jobs plan for any segment of the population, including for people with disabilities or any other underserved minority. What the Republican nominee has proposed is a series of healthcare reforms “ready for implementation that follow free market principles and that will restore economic freedom and certainty to everyone in this country.” Proposed reforms include removing the individual mandate, block granting Medicaid, allowing insurance policies to be sold across state lines and removing obstacles to the free market for the pharmaceutical industry. Trump has yet to acknowledge people with disabilities in his speeches, or complete RespectAbility’s #PwDsVote 2016 Campaign Questionnaire about disability rights and equal opportunity for all – a 16-point questionnaire that presumptive Democratic nominee Hillary Clinton has completed. RespectAbility is nonpartisan and does not endorse candidates. In the last election cycle of 2012, the issue of disability very rarely came up as well. In fact, the word “disability” was hardly mentioned at town halls, debates and party conventions. Previous Post Who is Margo Hudson, the Woman who Recited the Pledge of Allegiance at the RNC? How do Convention Goers at the RNC with Disabilities Feel about Trump and Republican Party?